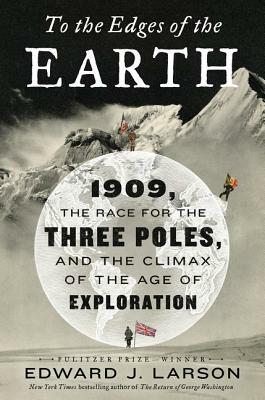 From the Pulitzer Prize-winning historian, a "suspenseful" (WSJ) and "adrenaline-fueled" (Outside) entwined narrative of the most adventurous year of all time: in 1909 three daring expeditions–led by Ernest Shackleton, Robert Peary, and the dashing Duke of the Abruzzi–simultaneously raced to the top, bottom, and heights of the world. As 1909 dawned, the greatest jewels of exploration—set at the world’s frozen extremes—lay unclaimed: the North and South Poles and the so-called “Third Pole,” the pole of altitude, located in unexplored heights of the Himalaya. Before the calendar turned, three expeditions had faced death, mutiny, and the harshest conditions on the planet to plant flags at the furthest edges of the Earth. Based on extensive archival and on-the-ground research, Edward J. Larson weaves these narratives into one thrilling adventure story. Larson, author of the acclaimed polar history Empire of Ice, draws on his own voyages to the Himalaya, the arctic, and the ice sheets of the Antarctic, where he himself reached the South Pole and lived in Shackleton’s Cape Royds hut as a fellow in the National Science Foundations’ Antarctic Artists and Writers Program. These three legendary expeditions, overlapping in time, danger, and stakes, were glorified upon their return, their leaders celebrated as the preeminent heroes of their day. Stripping away the myth, Larson, a master historian, illuminates one of the great, overlooked tales of exploration, revealing the extraordinary human achievement at the heart of these journeys. Edward J. Larson is University Professor of history and holds the Hugh & Hazel Darling Chair in Law at Pepperdine University. He received the Pulitzer Prize in History for Summer for the Gods and a National Outdoor Book Award for An Empire of Ice. His other books include the New York Times bestseller The Return of George Washington. Larson is a past fellow of the National Science Foundation’s Antarctic Artists and Writers Program. He lives in Georgia and California.